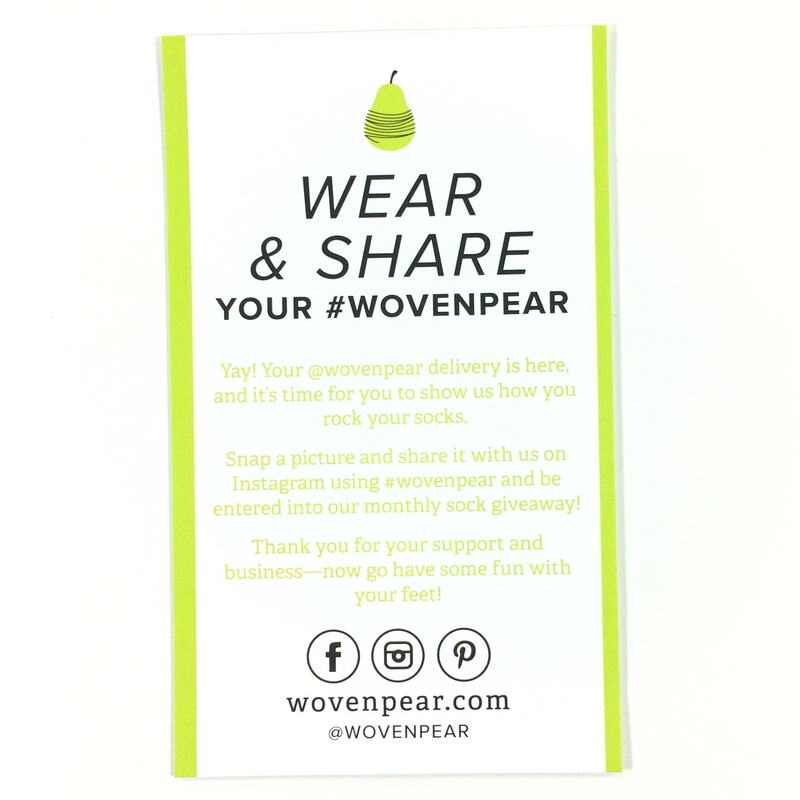 Woven Pear is a monthly sock subscription box that sends the coolest designs! 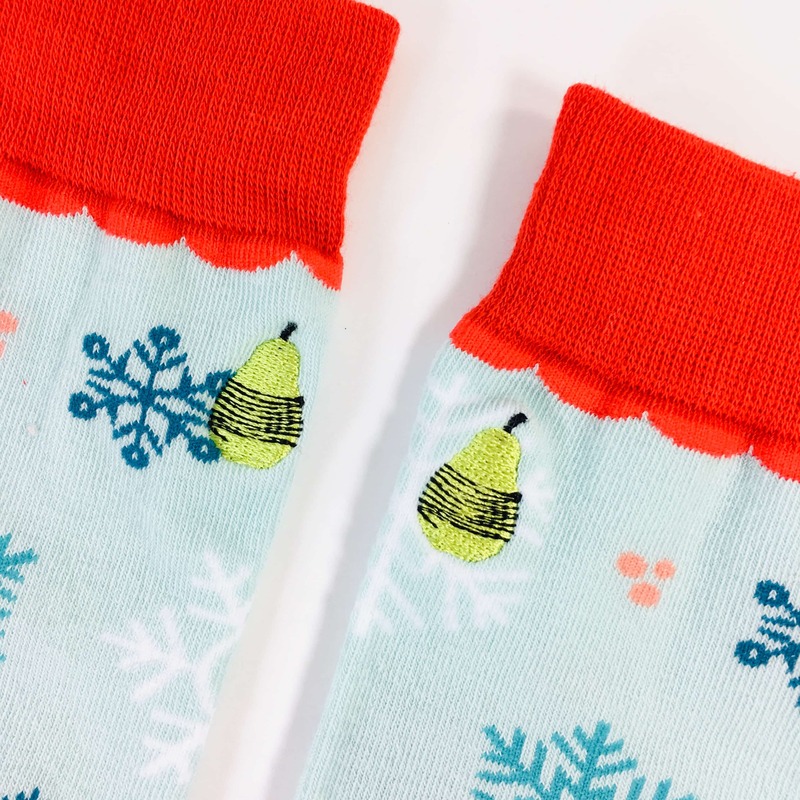 Every month you’ll receive 3 pears of exclusively designed socks available only to monthly subscribers. 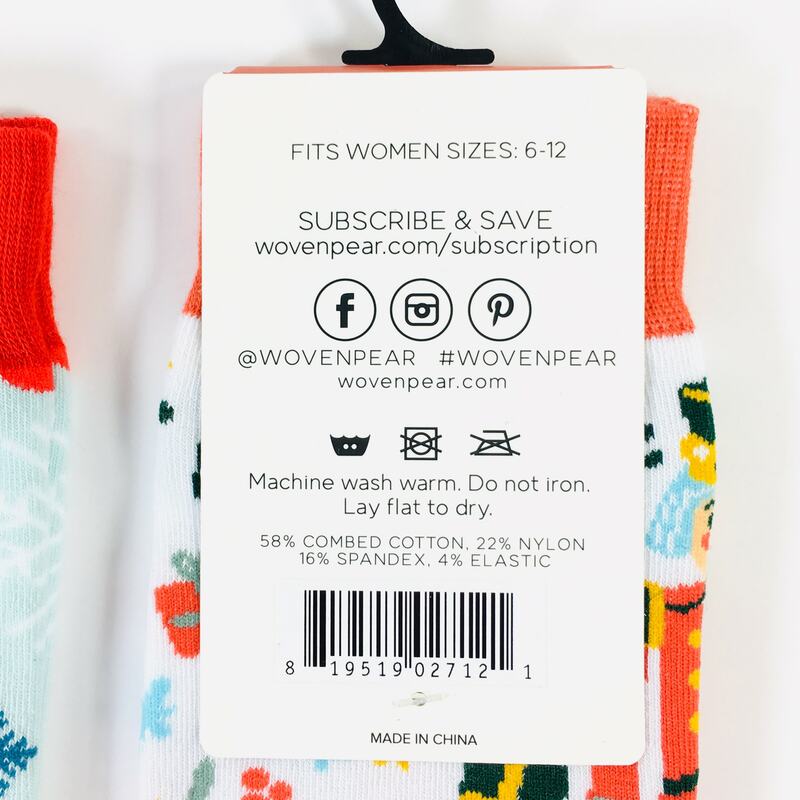 You can Pick a Pear for $9.99 a month, or go for the Sockbox, which is 3 pairs for $27.99 a month. 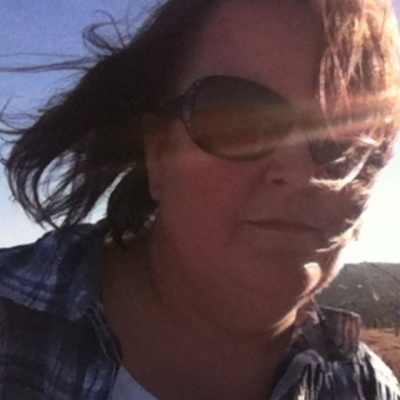 Longer subscriptions come with discounted prices. 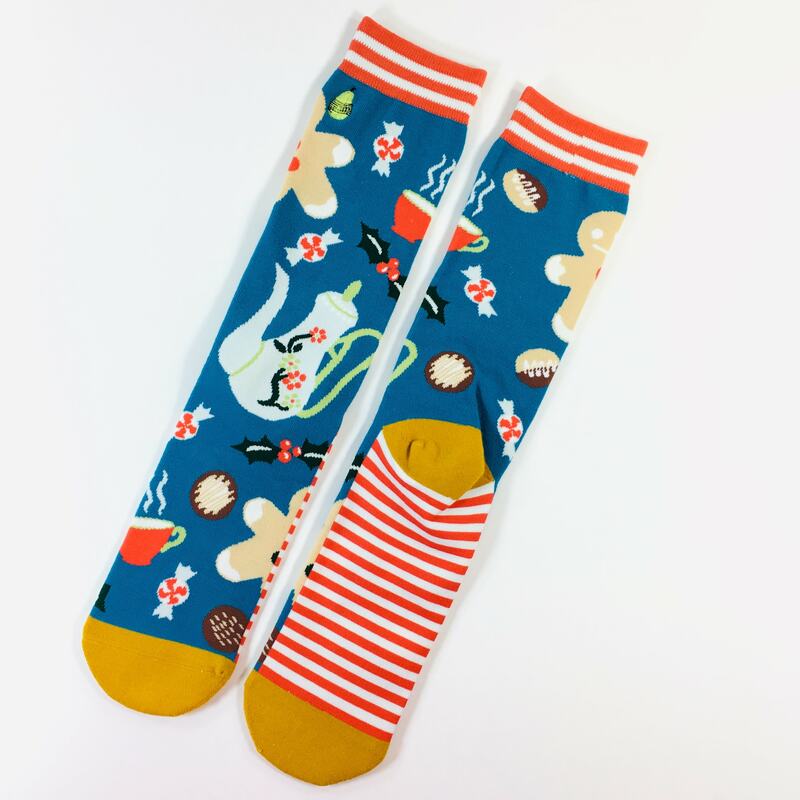 In February 2015 we saw a need for a women’s sock brand and figured we should get our foot in the door. Seriously, our socks are the best and are made of extremely high quality combed cotton. Each pear is dyed and dipped by hand to ensure a unique pop of color. We’re here to make a difference and to create a brand that will empower women to stand up and put their best foot forward. My socks came in an awesome box! I opened it up to see a discount card and my socks! 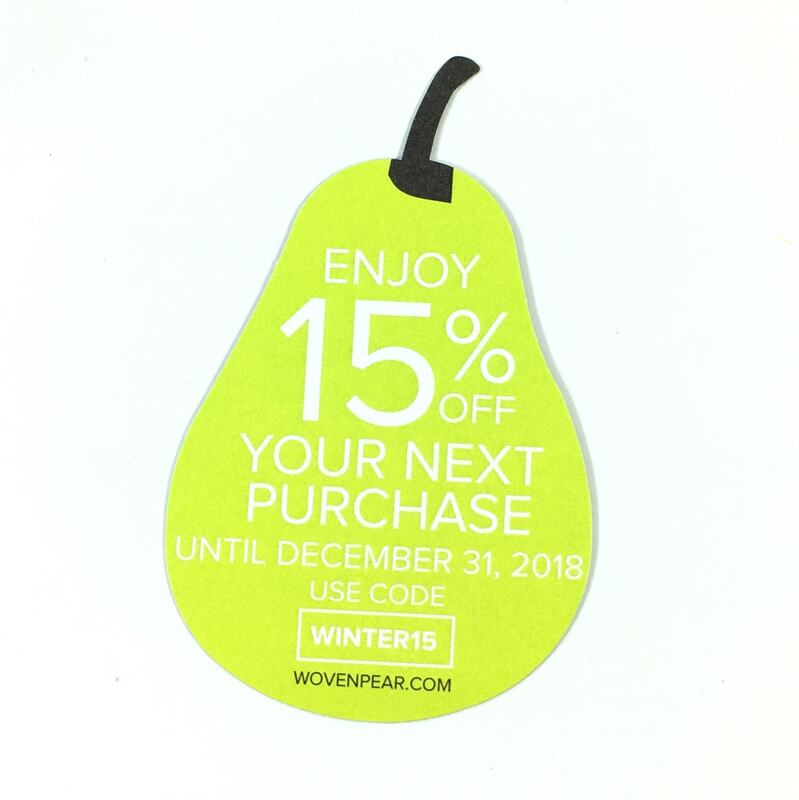 There was a discount code for a shop purchase. Wear & share your pair on social media, maybe you will get reposted. One more card about sharing on Insta etc! 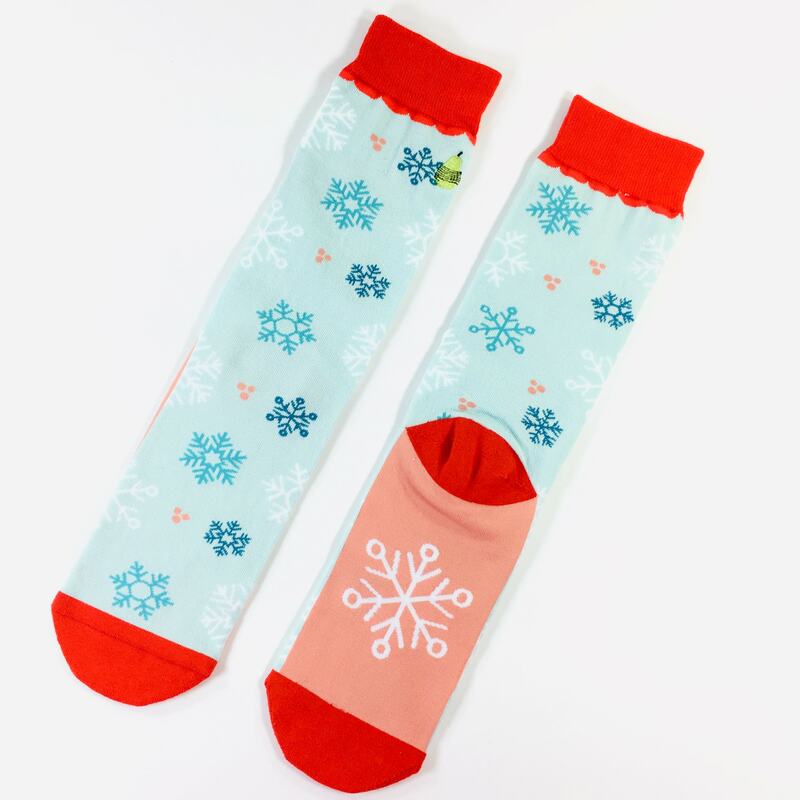 My sock designs were perfect for the season! We had seriously deep conversations at my house about which design was mine and which would go to each of my daughters! Each pair says it fits women’s shoe sizes 6-12 and is made with a blend of cotton/nylon/spandex/elastic. Each pair of socks has a signature pear embroidered on the cuff. I’m calling this first pair Winter Wonderland because they are in bright beautiful colors and have snowflakes all over. The toes, cuffs, and heels are all a cozy shade of red while the bottoms are salmon pink with a giant snowflake. I should mention that the heels and toes are cushioned for extra comfort. This goes for each set of socks. These are obviously The Nutcracker! The Sugar Plum Fairy and the Mouse King plus trees and presents abound in this design. 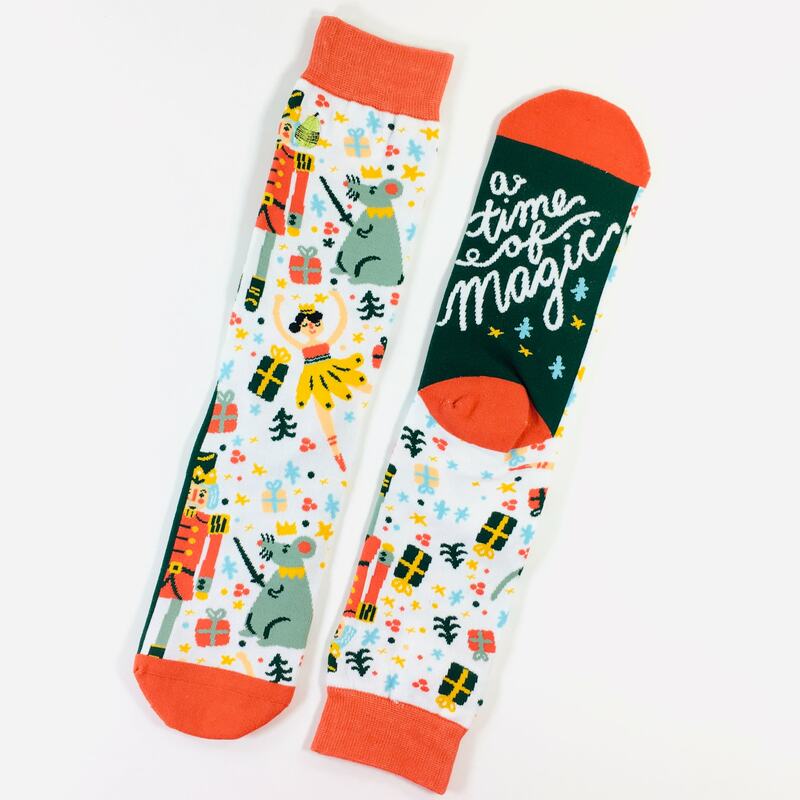 The back of the socks say “A time of magic & of dreams”. These are going to be mine and I call them Tea and Treats. Gingerbread men, a tea pot, cookies, peppermints, and holly all everywhere, along with a couple of piping hot cups of tea. What can I say, I love tea! 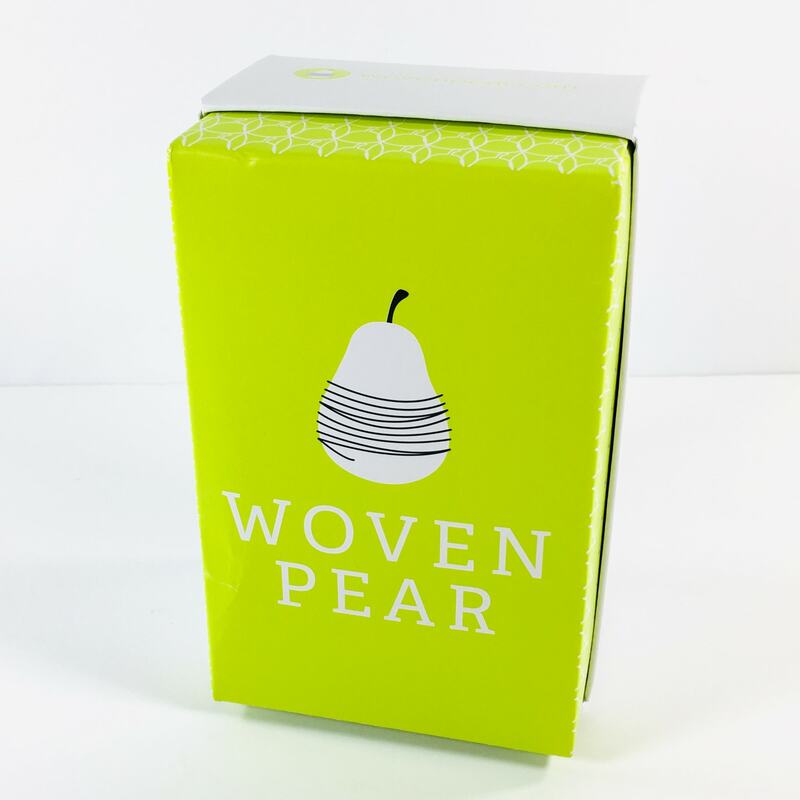 I thought my very first box from Woven Pear was absolutely adorable! I loved the designs, which were just right for December, plus the socks are of amazing quality and are very soft and sturdy. I can definitely get hygge with these socks, along with my cup of tea and a good book. Maybe others won’t see them when I’m out and about but they certainly make me smile when I catch a glimpse and they are too cute. 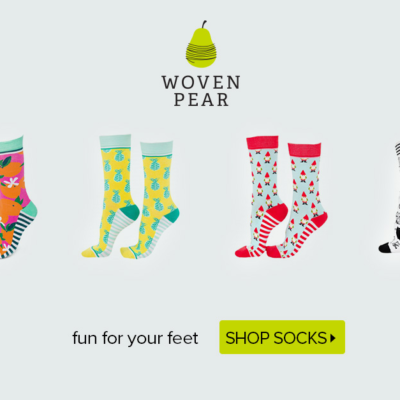 Socks like these go for $15 a pair on the Woven Pear website, so it’s like getting a pair for free along with a discount on top of that. That makes it a great value in my book! 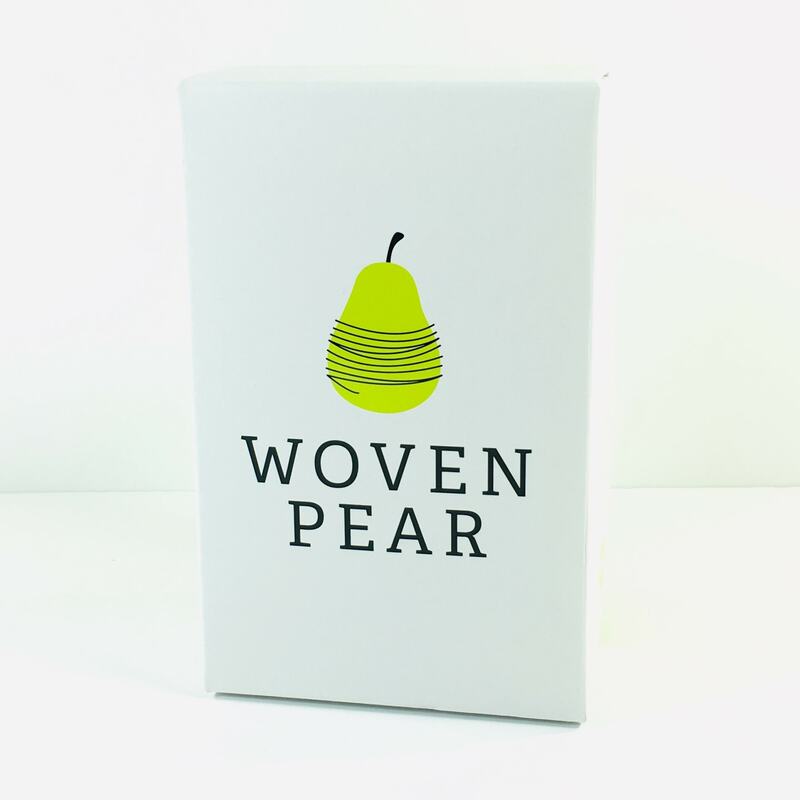 What do you think of the Woven Pear box? 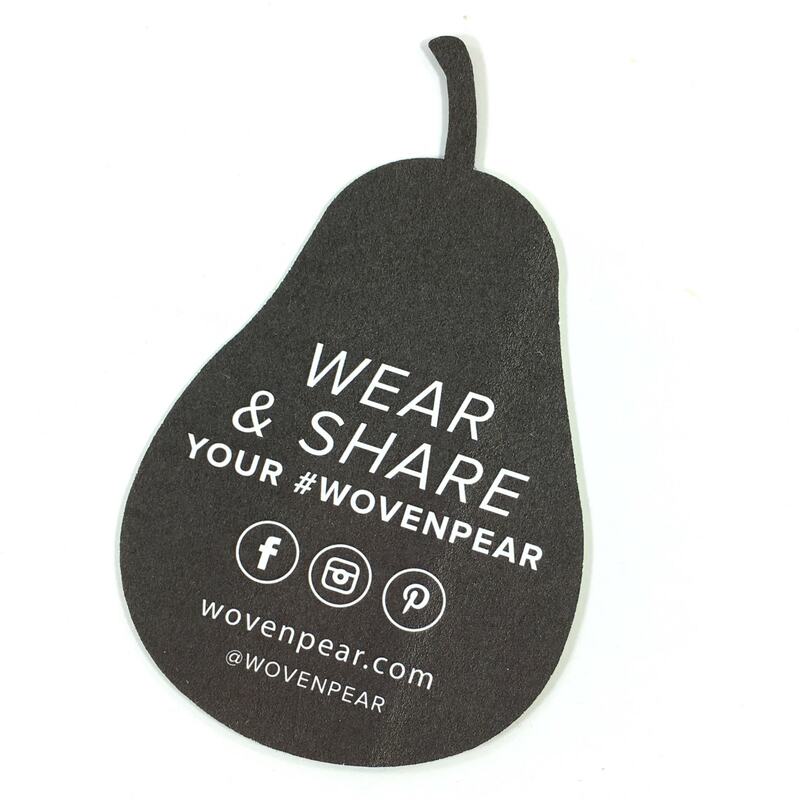 Visit Woven Pear to subscribe or find out more! 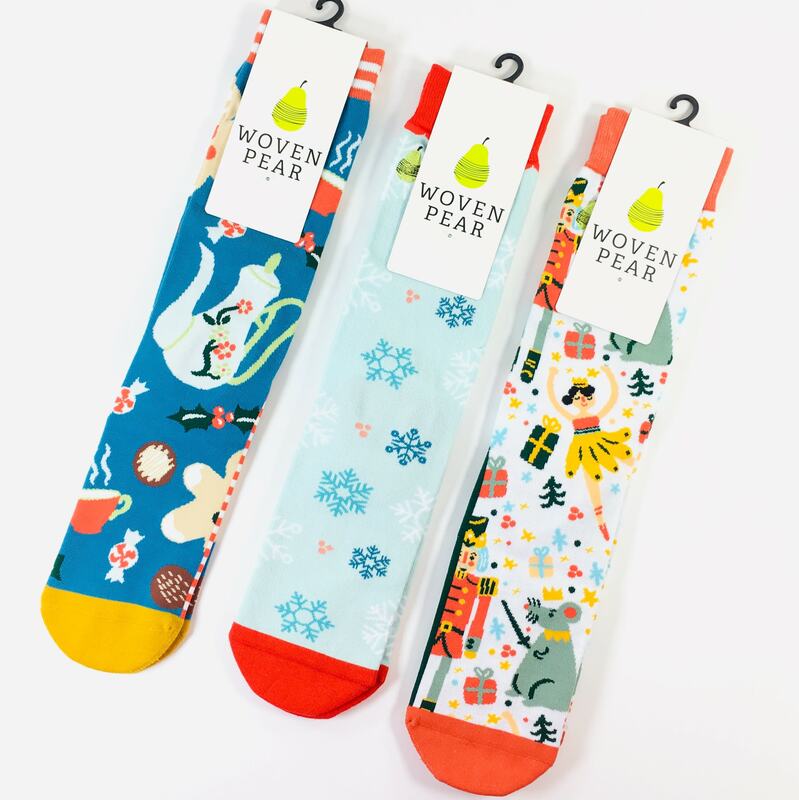 Every month we'll send you 3 pears of exclusively designed socks available only to our monthly subscribers. Our socks are made of extremely high quality woven cotton. Each pear is dyed and dipped by hand to ensure a unique pop of color. We're here to make a difference and to create a brand that will empower women to stand up and put their best foot forward.